"Enjoy another variant of the popular solitaire card game"
The solitaire card game is very popular and as such a wide range of variants of it exist. 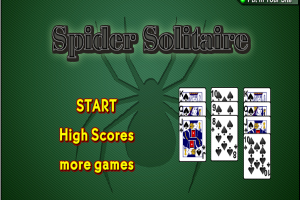 Now, elsewhere on Winportal the vast majority of these are individually presented and here we present you another one, called Spider Solitaire. This variant is played with only one suit of cards and the objective is to arrange the cards from the piles in descending order as to have them removed. Here we won’t explain the details of how to play this solitaire variant, but we can tell you it supports dragging and dropping cards and each card move made will cost you ten points. So, you can play to get on top of the high-score list to see if you’re really that good at playing Spider Solitaire. Now, note that this game requires Adobe Air to be installed on your system, so if you don’t have it yet you can download this freeware installation from Winportal as well.